WINNIPEG, April 3, 2019 /CNW/ -Three iconic Canadian brands are coming together under one brand – Canada Life – to better serve their more than 13 million customer relationships across Canada and to position the companies for even stronger growth. VIDEO: Welcome to the new Canada Life. Effective immediately, The Great-West Life Assurance Company, London Life Insurance Company and The Canada Life Assurance Company will begin a journey to move to one brand in the Canadian market. This newly developed Canada Life brand builds on the three companies' proud histories, whose stories began over 170 years ago. 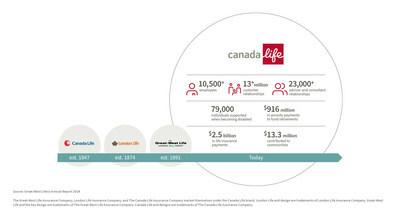 Canada Life will become the new brand under which the organization will create, deliver and communicate products and services in Canada across all of its lines of business. "Today marks the beginning of a new and exciting chapter for our companies in Canada," said Paul Mahon, President and Chief Executive Officer. "Bringing our companies together under one brand will allow us to deliver a simpler and unified experience for our customers, advisors and consultants, focusing on what matters most – helping Canadians reach their full potential, every day." "The new Canada Life is positioned well for continued growth and success," said Jeff Macoun, President and Chief Operating Officer, Canada. "Together with our employees, advisors and consultants, we're excited and optimistic about the task ahead of us. As one brand, we'll present a unified voice, product and service offering and a simplified experience for customers, advisors and consultants." "Our employees are central not only to our companies' growth, but to the relationship of trust that we've built with our customers, advisors and consultants," said Macoun. "Under the new Canada Life brand, we'll make it easier for them to deliver for our customers, advisors, consultants, and their communities." Quadrus Investment Services Ltd., Freedom 55 Financial, GWL Realty Advisors and GLC Asset Management Group Ltd. will all retain their current branding. Great-West Lifeco's businesses in the U.S. and in Europe are not affected by this change.